My son and I collaborated on a book series to encourage kids to eat healthier; the first book in the series is called, Give It a Go, Eat a Rainbow. I’d love to share tips based on my experience as a mom. Parents, I know what it feels like to have some picky eaters in the house at times. I’m prompted to share this post as I pick up this month’s edition of Sun Valley Property News, which features a picture and mention of our family book project. So excited! 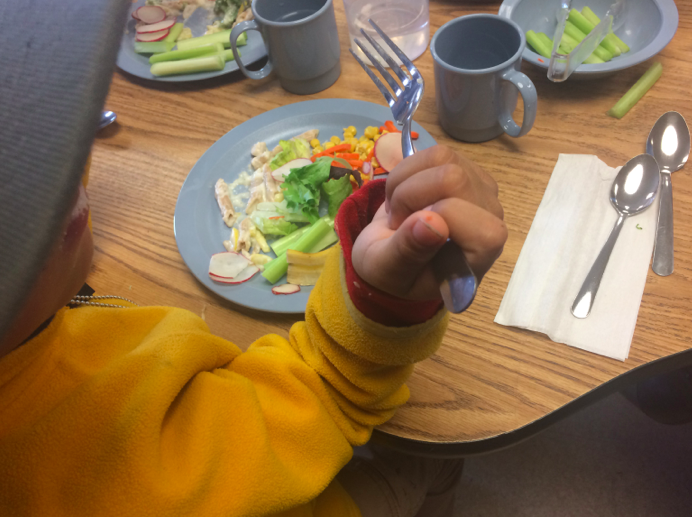 When talking about healthy eating for kids, I encourage parents to avoid food fights with children and keep experiences around food (especially healthy food!) very POSITIVE. The “secret” recipe: educate, inspire, and give choice. 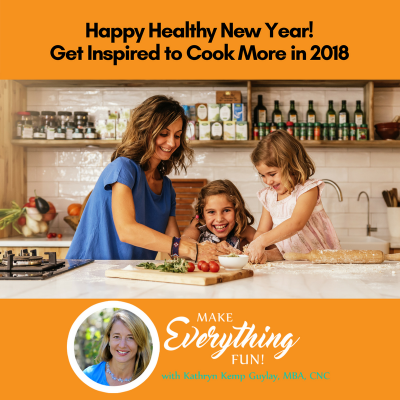 One of the most fun ways to involve kids in making healthy choices is to have them pick out recipes or at least have a role in preparing the food. 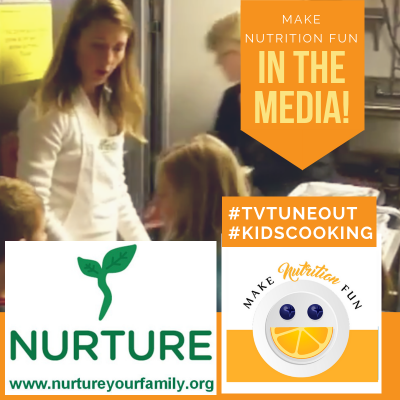 I have had the honor of being involved in large after-school events for “getting kids cooking”, and you can see from this video that even very small children are very capable of assuming important roles in the kitchen. These kids made Fiesta Casserole for families participating in a food pantry (meals for approximately 400 people!). They also made and tasted Aloha Rice. 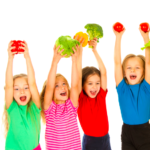 Encouraging healthy food in schools is another great way that parents can help their kids. 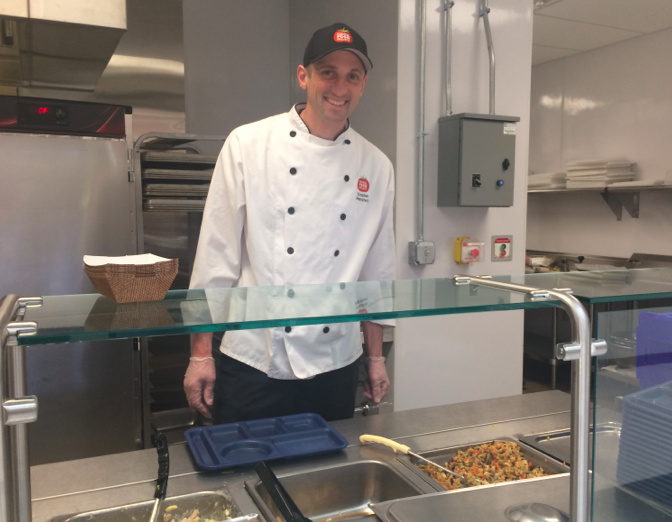 I’ve had the honor of visiting dozens of schools, and one of my most memorable visits was to the Boulder School District (in Colorad0) to see what Chef Ann Cooper was doing to make this school a healthy, colorful place. 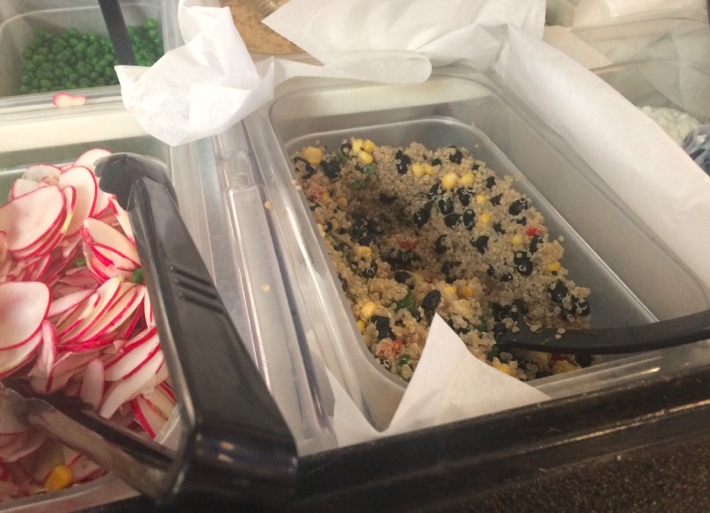 Tip #1: Don’t make any foods forbidden. Instead, teach kids that food is fuel and that there are “go foods” (healthy foods, including fruits and veggies) that provide the best fuel for their bodies. Then explain that there are also “slow down” foods (such as candy, sugary drinks, and junk foods) that might give a short jolt of energy but ultimately leave them feeling sleepy and hungry. Allow kids to make choices about how they want to fuel their own bodies. When you ask kids how a car will run if you put junkie fuel in the gas tank, they’ll likely say, “It won’t go” or “It will break down.” Help them understand that improper fuel for their body will do the same to them over the long run. Kids want to have energy to play and do well in sports and in school. Let them know that the best fuel for success includes protein, whole grains, calcium-rich foods and, of course, fruits and veggies. Educate, inspire, and give choices. 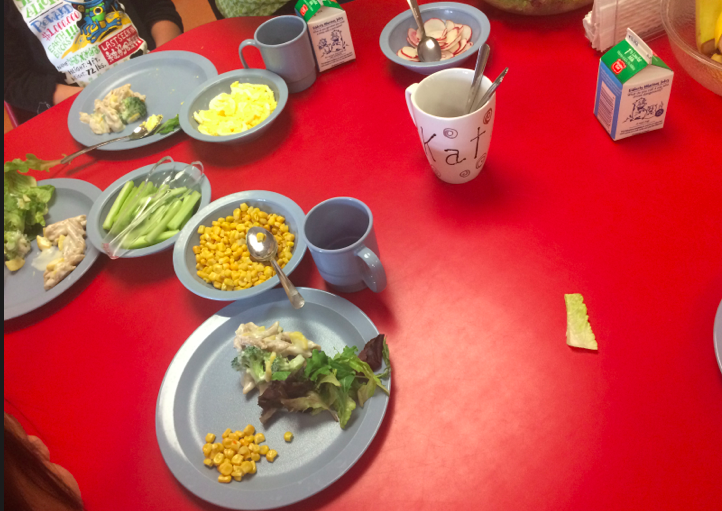 Photo above: Preschool kids choose from a healthy selection of foods. Tip #2: Display healthy foods where you can see them most easily. Set up your home (especially your pantry and fridge) using the exact same strategies that grocery stores use to get you to buy the higher margin items, such as processed foods. Higher margin foods are usually right at eye level where you are most likely to notice them. Go to your own pantry and fridge and see what is at the eye-level of your kids. Do you see graham crackers, goldfish, and higher sugar foods? Move them. Again, don’t banish them, just make them harder to see. Replace them with clear containers full of sliced carrots, peppers, and other delicious veggies in season. Add cheese sticks, nuts, and seeds within easy reach. Then don’t hover while the little ones reach for a healthy and satisfying snack. 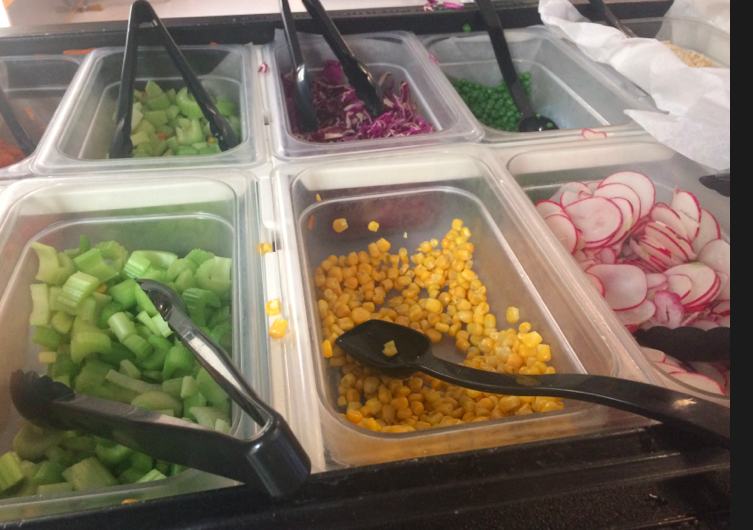 Photos above: Elementary kids choose from a beautiful salad bar of foods. Tip #3: Plan meals and shopping in a neutral, private place. The grocery store, with its tactics to entice with cartoon characters, colorful packaging, and strategic placement, is not the place to negotiate what’s for dinner tonight. Avoid power struggles around food by involving children and giving them choices by shopping and planning meals in a neutral and relaxing place like the kitchen table (when no one is overly hungry and, therefore, crabby). Ask your kids, “What do YOU think we should we include on our shopping list this week?” Use pictures of healthy foods (like food cards) and have kids sort out the things they’d like to buy. Maybe the fourth or fifth time looking at pistachios on a food card will be the time when your child decides to give them a try. Remain neutral yourself, and ask your child to follow a simple rule about sorting through foods: “Please do not call anything ‘yucky’, that is hurtful and not allowed.” Using neutral or interesting descriptions such as “that kale looks bumpy” or “that watermelon looks juicy” is perfectly fine and should be encouraged. Photo above: A preschool child talks about how the celery is “crunchy”. Tip #4: Turn your “problem” child into the “solution.” Like everyone else, kids love to feel valuable and needed. Make the problem your problem and ask your child to help you! “Mom really wants to eat more dark orange veggies because she heard that they are really good for her eyes and hair. 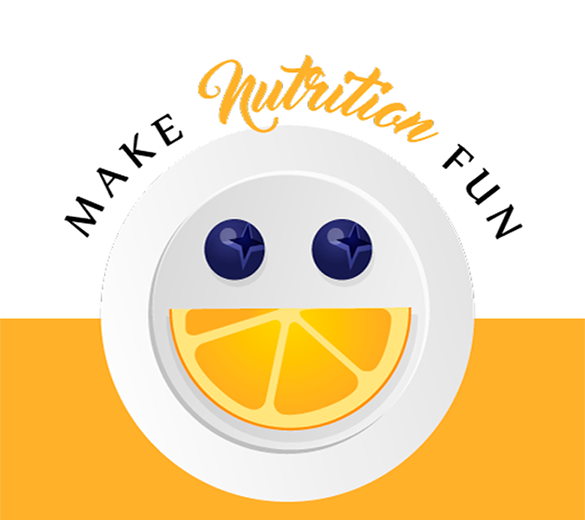 Can you help Mom find some dark orange veggies that will be good for her?” Or, “Dad learned that Olympic athletes eat lots of blue and purple fruits and veggies for energy, and he wants to be able to finish that race he signed up for. 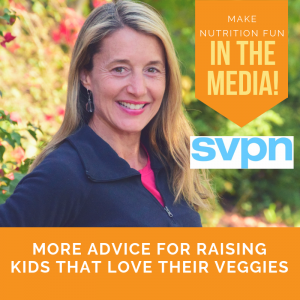 What would you suggest?” When given a problem and some empowerment, you won’t believe how your child will run to find some butternut squash, blueberries, and eggplant and maybe just try them along with you! Photo above: Delicious lunches are served with choices and a smile. Tip #5: Engage all of your child’s senses to expose him or her to healthy foods at the youngest of ages. It takes between 7 and 16 exposures for a child to become comfortable with a new food. 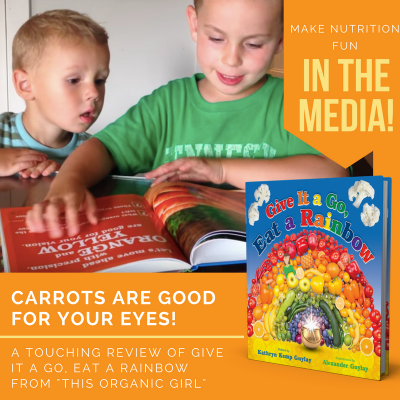 In my new book, Give It a Go, Eat a Rainbow, I use photographs of real veggies mixed with whimsical illustrations (a format called “augmented reality”—think Pokemon Go for a healthy eating book) to create a story that kids are immediately drawn to. The illustrations are by my 13-year-old son—a huge advantage, given its peer-to-peer messaging—and they tell the story of Blake who “feels sleepy” (lacks energy) before finding strength and vibrancy through a magical journey of fruits and veggies. Fun and entertaining exposure to produce at a young age can also include art projects (such as sponge painting using veggies like broccoli florets), music (ever play the drums with carrots? ), and games (such as going for scavenger hunts in grocery stores, using bingo to try new foods, and others). 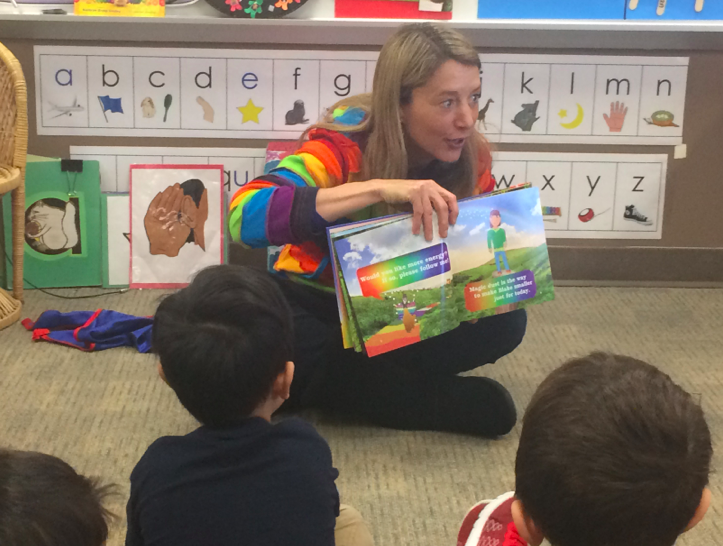 Photo above: Reading to preschool kids from Give It a Go, Eat a Rainbow. The sequel to the book, Where Does a Rainbow Grow? is now available! Check out the website for the book series! The point is to have FUN with food; and before you know it, your picky eater is now an adventurous (and healthy) eater.